The extrusion is up to 33 percent faster due to a reduction of the number of cells on the extrusion front. The extrusion is more robust due to a simpler cell topology on the extrusion front and advances between 7 and 17 percent farther, so you get more high-quality, hexahedral cells and overall lower cell count. Figure 1: Cuts through a hybrid mesh generated by the updated T-Rex for the NASA CRM. For this particular mesh, the time required to generate the anisotropic cells was reduced by 46 percent, the number of agglomerated cells increased 15 percent, and the total number of cells for the overall mesh was reduced by 20 percent relative to the previous version of T-Rex. Updated CAD File Readers: In addition to implementing the latest libraries from our CAD reader provider, the reader has been implemented as a separate process for improved robustness. Drawing Guide: A drawing guide consisting of an array of vertical and horizontal lines can be overlaid on the Display window as a visual aid for aligning points on the screen for various operations. Also, the option to disable snapping to a selected point (previously available only in the Tweak command) has been added to all other commands using the 3D point placement tools. 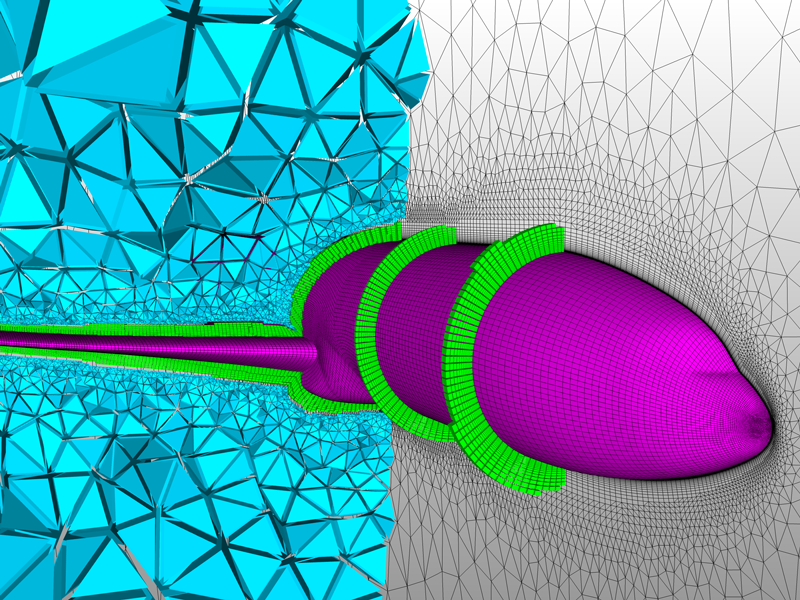 New CAE Solver Support: Native support is now available for the Edge and LAURA flow solvers. Project Distribution: A connector's shape can be projected while retaining its distribution attributes (whereas the distribution function had always been changed to the general type). Save Selection: Using the Save Selection As command, selected entities (and all other entities on which they depend) can be written to a new PW project file. With the Save Environment As command, all settings – defaults, layers, properties, views, saved examine cuts, rules, etc. but no entities – can be written to a PW file for loading at the beginning of a new project. Scripted Entity Selection: Two new Glyph commands provide more control over entity selection. One command returns a list of the currently selected entities. The other allows specification of the entities to remain selected upon script termination. You can get Pointwise V17.2 R2 from our website's download page.